Above: Blues guitarist Slam Allen performing in Fat Cats. Right: Howl at the Moon playing in Headliners. Below: The comedy of Second City in Headliners. Members of Epic's activities staff welcome guests back to the ship after a day in port. 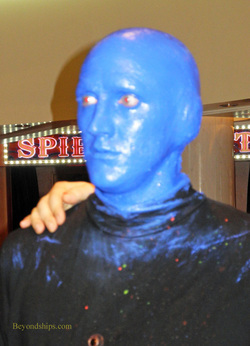 Featured in the Epic Theater are the Blue Man Group (above) and Legends in Concert, in which performers pay tribute to famous artists (below).